There's a moment like that in the creative process, if I'm lucky. Sometimes I'm focusing so hard on the details of my work that I am absolutely dumbfounded by the final product; I have no idea where it came from. This jar of glow is one of those moments. The subconscious is working constantly, sifting through data to compile resolution. When it comes up with a theory, the subconscious wants to tell you, but it doesn't speak the same language as the conscious does. Subconscious starts throwing symbols at you, trying to get its point across. Like a mime. This is the phenomenon writers mean when they say the characters take over the story. Because the author is literally building a world, the subconscious can use the characters as symbols to frame the data it has collected about human nature. When drawing a mason jar, one should be drinking from same. I was sleeping on the sofa at Abbey's house when my brain presented a very specific image: a ball mason jar in the dark, with its shoulders reflecting light. I love the subtle refraction of darkness, so I was unsurprised by the lovely image. I was surprised when I went back to sleep and my brain presented the image again, so strongly it woke me up. Not to be deterred from an excellent nap (especially since the bird was also napping) I closed my eyes again, and saw the same thing. 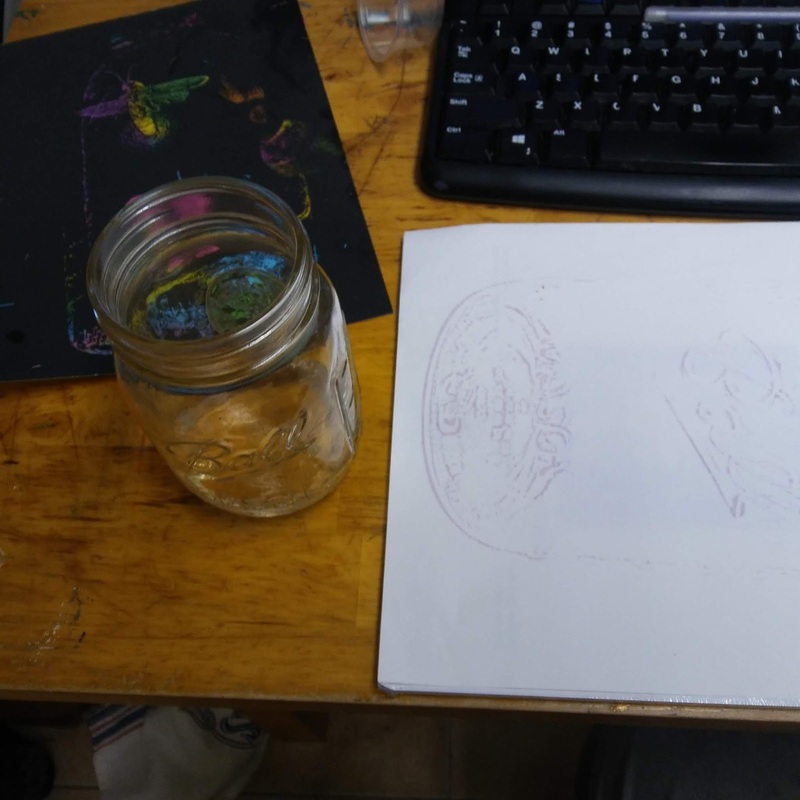 This time I got up off the sofa and tried to replicate the image with an actual mason jar on the counter. Fireflies in jars are an integral part of childhood memories for my generation, possibly for everyone's. Again I was unsurprised when my brain told me there were lightning bugs - specifically two - in the picture. The internet provided me with several photos of bugs in flight, but my brain told me immediately which were the right references for my project. 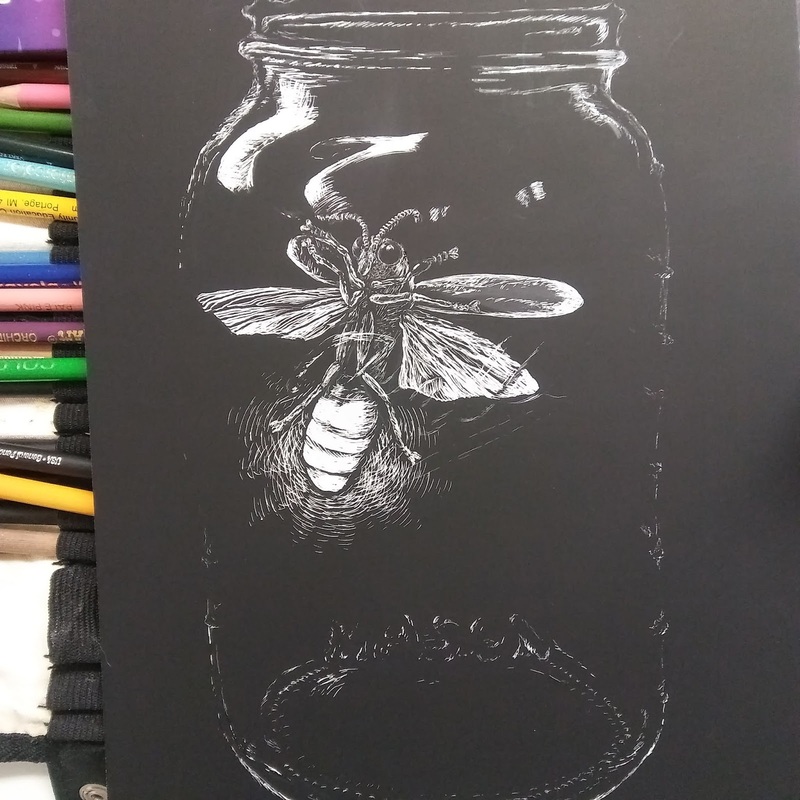 While I practiced on scratchboard, drawing fireflies that didn't look like grasshoppers, my brain informed me that it would be really badass if there were also a nuclear power plant in the bottom of the jar; because this is our world. There's an imminent danger lurking in the bottom of what we find nostalgic. Charity Hospital is a time-honored tradition within the tradition of NOLA. These pictures bring back memories for me that are interesting, not horrible. My subconscious only says "It's time for dessert! ", so my writing is merely a reflection of the conscious thoughts crashing into each other and the sides of my awareness, as billiard balls in zero G and a rubber room. Enough leaks out that I can enjoy the results, and laugh! Leaky billiard balls are the best, barney~!